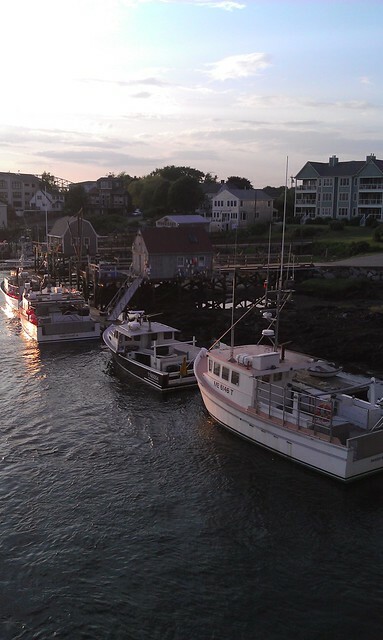 CoLab Radio » Blog Archive » Can anchor institutions save New Hampshire’s polluted Great Bay? Can anchor institutions save New Hampshire’s polluted Great Bay? 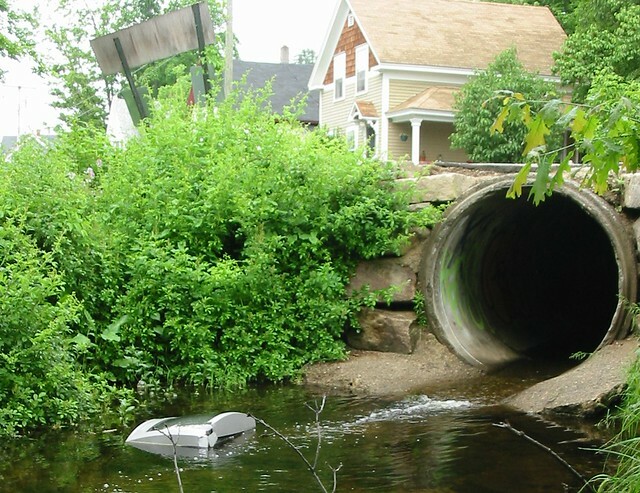 In Wakefield, New Hampshire, a Great Bay headwater stream acts as a dumping ground for a television set. Anchor institutions, particularly colleges, universities, and hospitals (“eds and meds”) have received attention in recent years for their ability to stimulate economic development and urban revitalization in inner cities. The University of Pennsylvania’s West Philadelphia Initiatives and the University Hospitals Vision 2010 Program in Cleveland, Ohio are among the most high-profile cases of anchor institution involvement in community development. These cases have been considered successful, and various entities have made efforts to advance anchor-community partnerships as a means for economic progress. • and have interdependent relationships with their communities. Higher education institutions, hospitals, museums, public libraries, and local businesses are just a few examples of entities that may act as anchor institutions. I used my master’s thesis for Tufts University’s Department of Urban and Environmental Policy and Planning to investigate the roles of a more rural anchor institution. The University of New Hampshire (UNH), in Durham, plays very different roles from the previously discussed anchors in Philadelphia and Cleveland. As an undergraduate and, later, an employee of UNH, I realized its importance to the area was obvious – it is a major employer, has approximately 15,000 students, and conducts research in many areas. UNH, like all U.S. land-grant universities, runs a cooperative extension that aims to share university-generated knowledge in areas such as agriculture and forestry with interested local residents. Despite the importance of rural and suburban anchors such as UNH, the study of anchor institutions has largely been restricted to inner cities and other high-need urban areas. In addition, the literature of anchor institutions has paid little attention to their potential beyond community revitalization and economic development. In my thesis I investigated the environmental roles an anchor can play, studying how UNH and other local anchor institutions participate in managing and protecting Great Bay, a nearby estuary whose pollution problems have triggered major local disputes over its management. Great Bay is a 17-square-mile estuary in New Hampshire. The accompanying watershed, a 930-square-mile area that drains into the Bay, encompasses 48 towns: 39 in New Hampshire and nine in Maine. Great Bay supports a variety of activities, including boating, kayaking, fishing, and bird watching. The Bay is the centerpiece of an area that prides itself on its scenic coastal landscapes and ample recreation opportunities. In recent years, however, Great Bay has faced severe ecological threats. The result has been political controversy, with state and local leaders strongly disagreeing over the best way to protect Great Bay. 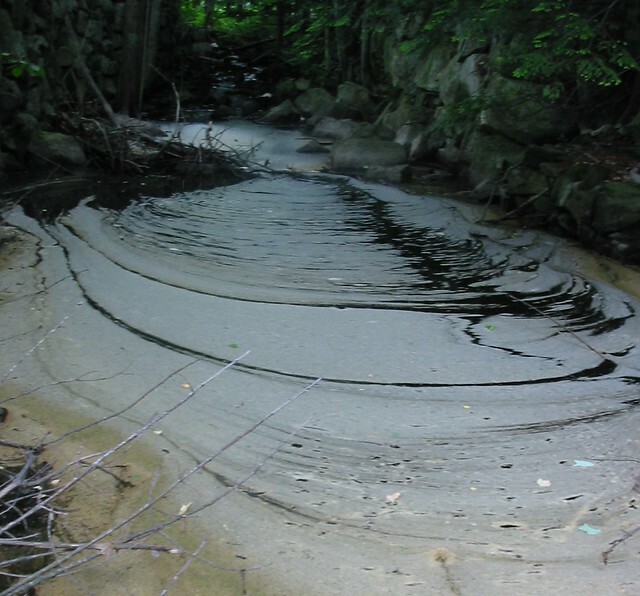 Polluted water flowing from a horse farm near Danville, New Hampshire. One of the most serious problems, and certainly the most politically divisive, is nitrogen pollution. Nitrogen is a naturally occurring element that exists in all living organisms, and it enters the water through a variety of natural processes. All healthy estuaries need some nitrogen to function normally. Excess nitrogen is generated from such varying sources as agriculture, wastewater treatment plants, fertilizer application, and septic systems. When too much nitrogen enters coastal water, it acts as a fertilizer and triggers algal growth. This growth creates many problems – the first being a sticky, smelly green mat that sits on the water’s surface, limiting its aesthetic value and recreational potential. This mat blocks needed light from reaching organisms in the water. The algae also consume oxygen, limiting the amount of oxygen available for fish and other species. In many parts of the world, excess nitrogen has threatened vulnerable species, caused massive fish kills, and even caused “dead zones” where organisms cannot survive. 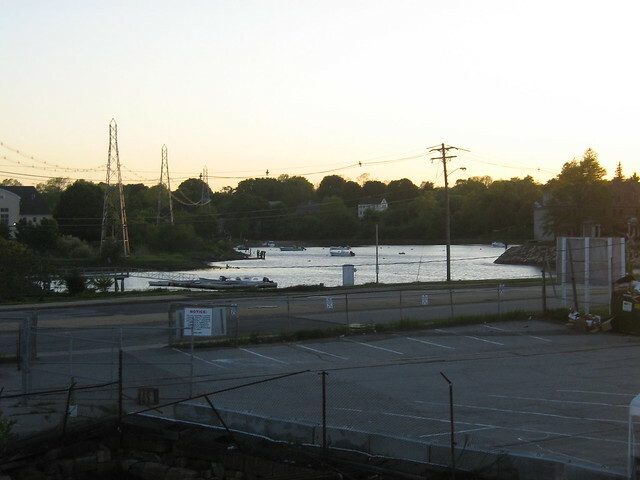 Fishing boats docked on the Piscataqua River in Kittery, Maine. While nitrogen loading in Great Bay has not reached that level of severity, its concentration in the estuary has increased exponentially. At the same time, a sea grass called eelgrass, which is a crucial breeding habitat for oysters, has diminished greatly. Many scientists believe that nitrogen is the culprit, and that if nitrogen concentrations in the Bay are not reduced, the oysters could lose their habitat. In 2011, the U.S. Environmental Protection Agency (EPA) mandated that all eighteen municipal wastewater treatment plants in the watershed adopt the strictest available, extremely expensive, technology, to limit wastewater effluent to three milligrams per liter of nitrogen. Some New Hampshire towns responded by suing EPA. The municipalities will likely not receive federal funding to enact the projects that the EPA demands, and some municipal officials expressed doubt that the nitrogen problem could be solved simply be enacting this expensive measure. When the EPA did not back down from their mandate, some communities complied and began planning their plant upgrades. But another group of communities, calling themselves the Great Bay Municipal Coalition, filed several unsuccessful lawsuits against the EPA, arguing that there was a lack of scientific evidence to justify such expensive measures. 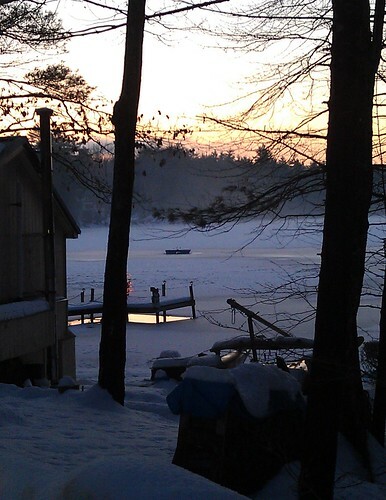 Winter on Swain’s Lake in Barrington, New Hampshire. The threat of a prolonged court battle seems to have diminished, and the EPA has agreed to allow a scientific peer review by neutral parties before holding the remaining Municipal Coalition communities responsible for wastewater treatment plant upgrades. However, this debate, which dominated local newspapers and their editorial pages for several years, has turned Great Bay’s management into a highly politicized issue. Local government representatives have spoken out against the federal government’s unwillingness to contribute funding, while many advocacy groups have been outspoken for one side or the other. The issue can be boiled down to a disagreement over the urgency of the problem and how much money the government should spend in trying to fix it. Local lawmakers are divided; some call for a less expensive, more cautious approach, while others argue that the problem is too urgent for anything but extreme, decisive action. This polarizing, politicized public discourse can be harmful to the environment in that it slows action. This fighting also means that it can be very challenging for anchor institutions and other powerful entities to contribute to Great Bay without seeming to “take sides” politically. With this controversial background in mind, I interviewed seven Great Bay stakeholders to assess the current state of anchor institution involvement in Great Bay. Interview subjects included scientists, policy experts, and advocates. The interviews were open-ended; I wanted to take an inventory of Great Bay’s political landscape and identify some of the benefits and limitations to anchor institution involvement. Following are some major findings. 1. UNH plays many roles, but funding issues overshadow all considerations. UNH is located very close to Great Bay, and would by most measures be considered the watershed’s strongest anchor institution. UNH contains more than a dozen research institutes, laboratories, and academic programs that focus fully or in part on watershed or estuarine health. A common mantra at UNH is that Great Bay is the “most studied estuary in the world”. Yet despite all this attention, there are clear knowledge gaps in the ecological understanding of Great Bay’s functions. Rather than fully benefiting from the myriad research that takes place within its boundaries, Great Bay sometimes serves as more of a natural laboratory than a resource to be protected. Many interview subjects expressed concerns over the amount of monitoring that happens within the estuary, and the lack of ecosystem-level understanding of how different parts of the Bay affect one another. New Hampshire, without an income tax or sales tax, has the lowest per capita higher education spending in the U.S. This lack of funds drives up tuition for students, and it also limits researchers. The traditional academic model does not lend itself well to environmental protection. Many environmental departments are compartmentalized, with, for example, one expert in policy, another in water chemistry, a third in marine mammals, and so on. Many researchers study Great Bay, but in very different ways. However, collaboration is possible, and, if Great Bay is to be understood as a holistic system, it will be necessary. When asked whether the academic model was to blame for the lack of understanding of Great Bay, one researcher instead blamed the lack of funding, saying that UNH scientists are forced to dedicate too much of their time to pursuing federal grants and other funding sources, without much freedom to stray from their prescribed courses of study. While attempts have been made to reconcile different areas of research within the Bay, funding limits innovation. 2. There are many nonprofits, a huge effort to collaborate, and little thought to include anchor institutions. I identified over 30 small nonprofit organizations with relevant missions within the watershed. These include land conservation groups, Great Bay advocacy groups, and small watershed associations, among others. In fact, six of the seven rivers that flow into Great Bay have at least one watershed advocacy group. 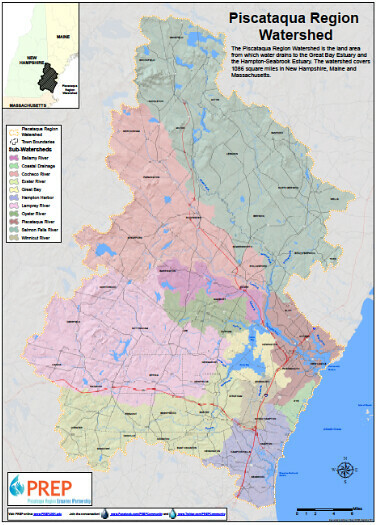 (The seventh, the Bellamy River, is overseen by the joint Bellamy & Oyster River Watershed Protection Partnership, which exists in addition to the Oyster River Watershed Association.) These nonprofits generally function on a very small scale, and almost all are entirely volunteer-driven. There is much cross-membership, with many “super volunteers” belonging to multiple organizations. Individually, these organizations lack resources and power, but collaboration between the groups seems to be growing. Smaller partnerships and alliances have been formed in various situations, and groups such as Rescue Great Bay have united larger groups of nonprofits. Development encroaches on an idyllic waterfront in Portsmouth, New Hampshire. Alliances like these are successful at bringing together groups whose missions and membership may overlap, but they often fail to include large and powerful anchor institutions in the area. These anchor institutions include a Naval shipyard, a decommissioned Air Force base, several private schools, multiple cultural institutions, a community college, and many businesses. Volunteer-driven organizations often lack the time and resources to develop the sorts of efforts that anchor institution could get involved in, but these efforts could pay off. Anchor institutions can contribute to watershed protection efforts in various ways. These contributions may be financial, but also in the form of meeting space, knowledge sharing, media connections, and event coordination. The other advantage of anchor institution involvement is credibility. Advocacy groups that fail to engage with their community risk being seen as fringe organizations. Anchor institutions are trusted community leaders, and their contribution to a project or an event can lend strong legitimacy. As previously discussed, the situation in Great Bay has been politicized and controversial. This controversy may be a disincentive for anchor institutions to get involved, but there are many opportunities for Great Bay involvement that do not involve battles over nitrogen management. If that disincentive can be overcome, anchor involvement could have a major impact in convincing citizens of the estuary’s importance. While UNH collaborates with Great Bay nonprofits in various ways, other anchor institutions have remained largely untapped. 3. Small businesses have major potential. Anchor institution definitions often only include nonprofit and public institutions, leaving out corporations. However, businesses can have a major impact. New Hampshire, as many interview subjects pointed out, is notoriously averse to government involvement in citizens’ lives. As discussed above, anchor institutions can bring attention and legitimacy to an initiative. In New Hampshire, as in many other places, a business advocating for protection of Great Bay may be more effective than a politician or government agency doing the same. The “Clean Water – Tasty Beer” campaign is a collaboration between the Piscataqua Region Estuary Partnership (PREP) and Portsmouth’s Smuttynose Brewery. PREP, created under the EPA’s National Estuary Program, is run from UNH and works to create and enact a Comprehensive Management Plan to protect New Hampshire’s coastal areas. PREP has a strong interest in community outreach and education, and this partnership was created because of what Community Impact Manager Jill Farrell called a “natural alignment” between PREP’s mission and Smuttynose’s dependence on clean, good-tasting local drinking water for use in its brewery. Besides a donation to PREP, Smuttynose also helped to sponsor a 2012 summer concert series promoting PREP’s efforts and distributed promotional pint glasses to local restaurants. Another example of small business involvement is the New Hampshire Coastal Conservation Association’s Oyster Restoration Program. With support from The Nature Conservancy, members of UNH, and various local businesses, the program aims to help reverse declines in oyster populations. Through the program, local restaurants save their used oyster shells, which are then picked up and placed in Great Bay to create needed substrates on which oysters can grow. A secondary goal of this program is to increase public awareness of Great Bay’s endangerment. Many popular restaurants are involved, which makes for a strong strategy. Harvard Business professor Michael Porter argues that by engaging in philanthropy, businesses can help to create a competitive advantage. Businesses in the watershed benefit from a healthy Great Bay in one way or another. By working to help protect such a natural resource, Smuttynose and other companies are working to preserve the lifestyle that attracts customers and employees to Southern New Hampshire. This Green Alliance blog post discusses the Smuttynose-PREP alliance further, highlighting the advantage of clean water both to beer brewing and to the company’s customers and staff. While these collaborations, individually, likely have fairly minor environmental results, the credibility of a prominent company devoting resources can be invaluable for a nonprofit organization and for public perceptions of Great Bay’s importance. By engaging in such initiatives, local businesses are helping to ensure their community stays livable and viable. With federal and state government reluctant (or unable) to provide funds to protect Great Bay, advocates will need strong local voices to encourage political support. Anchor institutions may act not only as a provider of financial and other resources, but also as a way to increase citizens’ awareness and support of Great Bay conservation efforts. When planning initiatives, advocacy groups should realize the potential of collaboration with anchor institutions. Often, these are best pursued on a case-by-case basis – in the examples above, these anchor-nonprofit collaborations were formed to pursue single projects, not a long-term sponsorship. This may be simpler, more attainable, and less daunting for both parties. 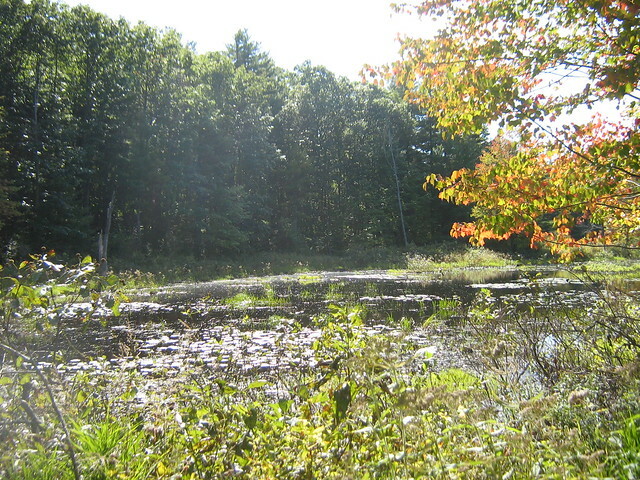 The 5,000-acre Pawtuckaway State Park preserves crucial habitats such as this wetland. Local businesses can position themselves as essential community anchors by becoming involved in philanthropic projects and other local events. For businesses, the advantage of charitable work can be more than just good publicity—this work can be used to create a more viable community in which to do business. The study of anchor institutions has much room for expansion. The roles of anchor institutions in rural areas, in environmental situations, and in politically controversial situations have been largely unexplored. Future efforts to better understand these anchor roles can help to provide clearer guidance for communities and nonprofits seeking to harness the strong power of anchor institutions in shaping community life. Post and photos by Liz Holden.